Jenkins image is secure, up-to-date, and pre-configured to work out of the box. Jenkins is the leading open source Continuous Integration and Continuous Delivery (CI/CD) server that enables the automation of building, testing, and shipping software projects. 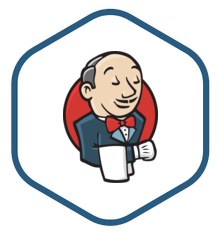 Jenkins is a Java based, open source automation server that is nearly synonymous with Continuous Integration and Continuous Delivery. Software development teams use it to be more efficient by building, testing, and deploying updates to software projects automatically and enabling more changes to be integrated more frequently, with fewer problems. Jenkins has been integral to the rise of DevOps-based software development. It is capable of organizing many different tools such as Chef, Puppet, and Docker into a single pipeline. At each stage, Jenkins can initiate and monitor the execution of a task, check the outcome, and initiate the next stage. Its large ecosystem of plugins enables it to be used for projects with nearly any combination of SCM tools, runtimes, and databases. Coordinates multiple tools into a CI/CD pipeline. Executes Apache Ant, Apache Maven, and Gradle based projects as well as arbitrary shell scripts and Windows batch commands. Large ecosystem of over 1,000 community-contributed plugins. Can be customized with new extensions and plugins to fit any project. Easy-to-use GUI enables simple configuration, management of plugins and automated tasks, and creation/deletion of users.